Mathematics 10 Edition MATHEMATICS: ITS POWER AND UTILITY, Tenth Edition, combines a unique and practical focus on real-world problem solving allowing even the least-interested or worst-prepared student to appreciate the beauty and value of math while mastering basic concepts and skills they will apply to their daily lives. The first half of the book explores the POWER and historic impact of mathematics and helps students harness that POWER by developing an effective approach to problem solving. The second half builds upon this foundation by exploring the UTLITY and application of math concepts to a wide variety of real-life situations: money management; handling of credit cards; inflation; purchase of a car or home; the effective use of probability, statistics, and surveys; and many other topics of life interest. 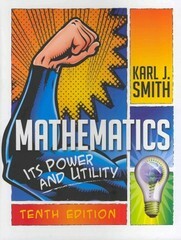 Unlike many mathematics texts, MATHEMATICS: ITS POWER AND UTILITY, Tenth Edition, assumes a basic working knowledge of arithmetic, making it effective even for students with no exposure to algebra. Completely self-contained chapters make it easy to teach to a customized syllabus or support the precise pace and emphasis that students require.